9 hours later, Pete woke up in his old bunk in the Gimel CMDR’s quarters. He took the liberty to shower and get back into his flight suit. He headed back to the hangar for the one last test he had to do before heading out. In the hangar, Pete found a probe droid and activated it. He programmed a course into it, then got out his datapad. He launched the droid and then waited a few second and touched the screen on his datapad. A turbolaser outside the hangar came to life, rotated towards the probe droid and shot at it. The first volley missed, barely, and the second hit home, vaporizing the probe droid. Satisfied, he hopped in his TIE Guardian. He programmed his nav computer to his jump point and launched. 3 seconds after clearing the hangar, he jumped. First, please welcome LCM Stradlin back to the fleet after a long absence. It’s good to have you onboard again! LCM Stradlin has joined as Delta 3-3. 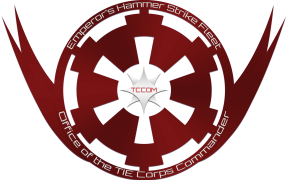 I have received one set of submissions for TIE Corps Spammers so far, there is still a week left for that and TIE Corps in Battle, so head to your simulators! The Hammer MSE has been completed and returned as well. Though I believe the merit awards are still outstanding. Wow, I have invested a bunch of time trying to get a high score. If only I was a better pilot….